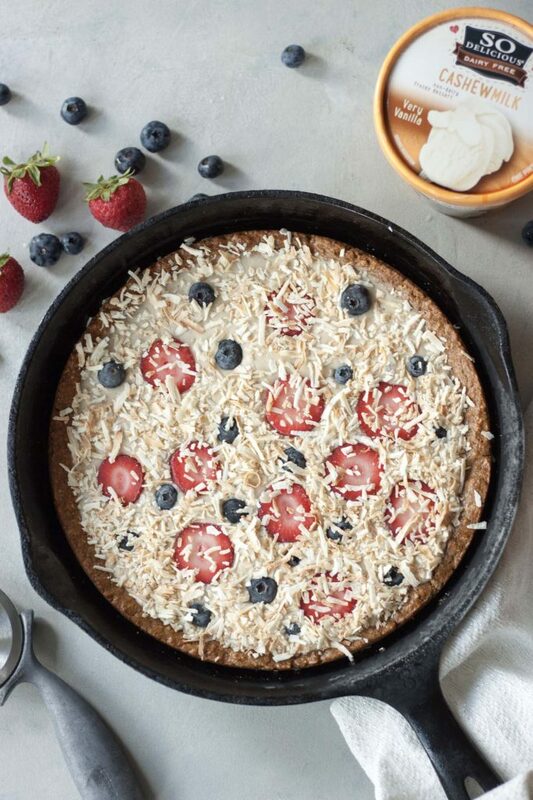 I created this Cast Iron Ice Cream Cookie Pizza recipe for the #FrozenFridays Recipe Contest, the contest is sponsored by So Delicious and hosted by Go Dairy Free. Is it Friday yet? I sure wish it was not just because of #FrozenFridays but because the last couple weeks and next one are crazy and I look forward to Friday even more so even if our weekends are busy. We are actually going camping this weekend which is why I’m sharing this recipe today. While we won’t be enjoying ice cream camping we will be doing a lot of cooking in the cast iron skillet and most likely I’ll be sharing some of the craziness on Instagram Stories if I have signal because for years camping eats have interested people. I blame it on the campfire fumes and my love for cooking. It really started with our s’more craziness combos, sandwiches, and some other off things like campfire nachos and desserts. Now to back to ice cream! This is a simple cookie recipe made in a cast iron skillet, that just happens to be gluten free and vegan. The fun comes when you top it with So Delicious Very Vanilla Cashew Milk Ice Cream and all the delicious toppings! We went classic with berries and toasted coconut as we were feeling simple but you could go all out with chocolate, candies, marshmallows, the options are endless. 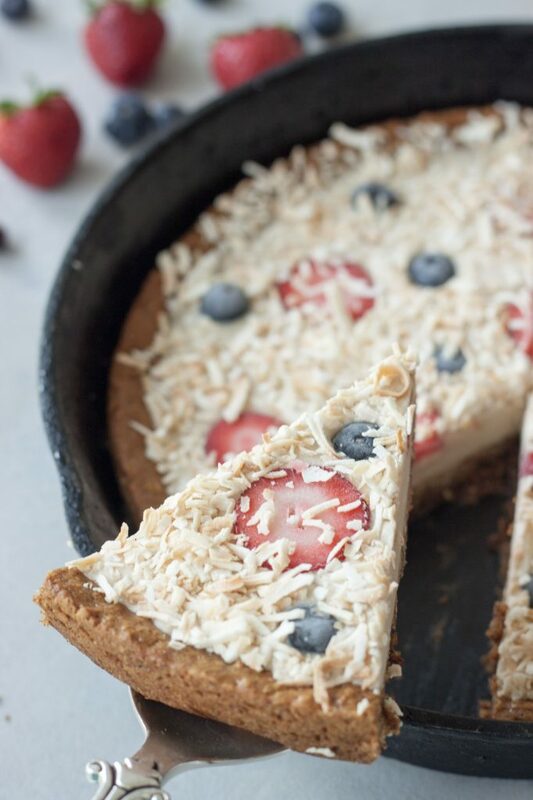 With the berries it’s actually a pretty healthy summer dessert but there’s nothing wrong with a little fun, it’s like actual pizza and what you’re in the mood for. This is a great one to make ahead when you’re having friends over in the summer or for kids. Just pull it out of the freezer, slice, and grab a slice no plates required. Shh… that means no dishes to do but don’t tell them. 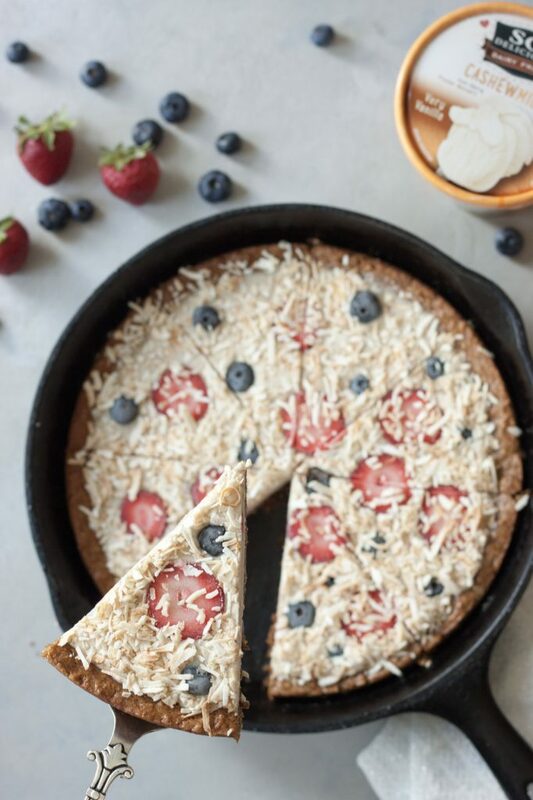 Again I created this Cast Iron Ice Cream Cookie Pizza recipe for the #FrozenFridays Recipe Contest sponsored by So Delicious and hosted by Go Dairy Free. As part of the #FrozenFridays Recipe Contest sponsored by So Delicious and hosted by Go Dairy Free readers get to vote for their favorites. You can read more here http://www.godairyfree.org/news/dairy-free-frozen-fridays. There will be over 30 recipes entered into the contest and you can vote starting August 6th and several voters will win a freezer full of So Delicious Products! Who wouldn’t want to win So Delicious Ice Cream?! I hope you consider voting for my Cast Iron Ice Cream Cookie Pizza. If they aren’t your thing, I also have my Seven Layer Coconut Ice Cream Bars! I know I’ve been a little crazy with the sweets and desserts in the last few posts but don’t worry I have fresh recipes coming! Next week I have a few fun smoothies and smoothie bowls to fuel the fun before I head to a concert next weekend! Oh it’s a good one and yes I may even have a smoothie bowl that is themed for the concert just because I’m goofy like that and find odd things inspiring my creativity. Yep like that Shake It Off Smoothie I made a couple years ago. 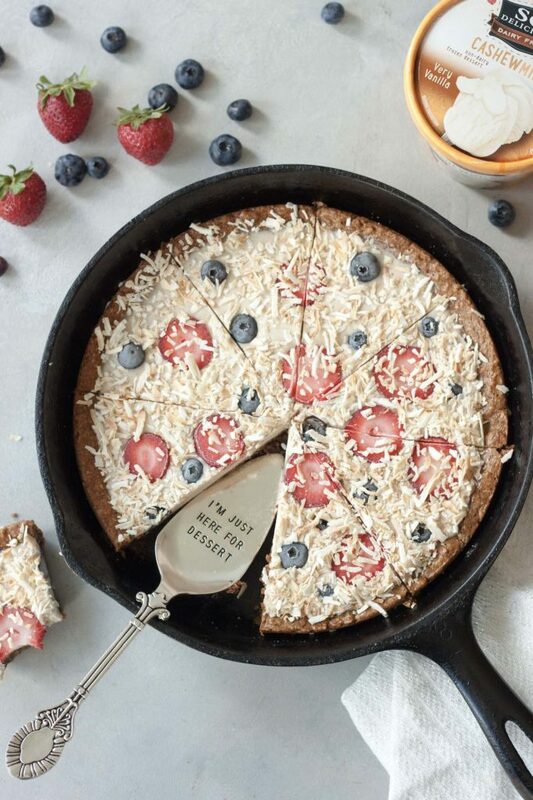 Delicious and fun this Cast Iron Ice Cream Cookie Pizza is sure to be a family favorite! 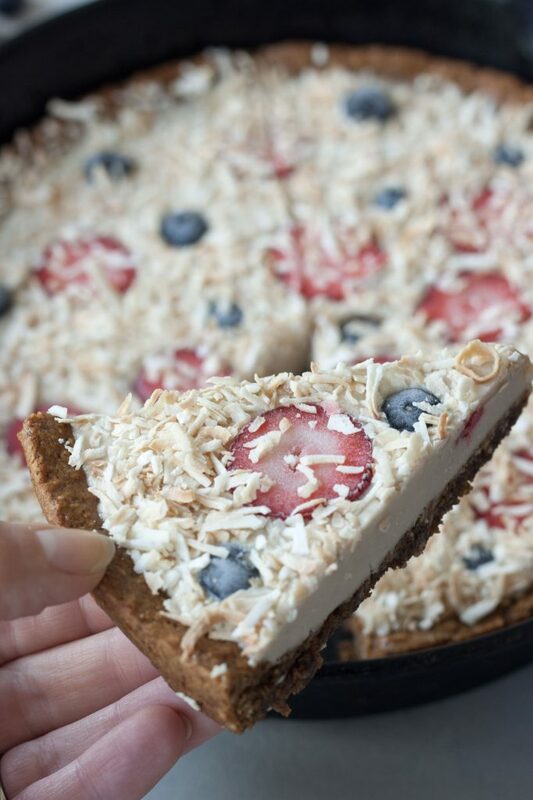 Gluten free and vegan friendly this easy to make dessert pizza has endless topping options. In a small bowl combine oat flour, baking soda, cinnamon, and a small pinch of salt if using unsalted almond butter. In a large bowl mix together almond butter, coconut palm sugar, vanilla, and milk. Add the dry ingredients into the wet and stir until just combine. Place the cookie dough in the refrigerator to chill for 20 minutes. Lightly oil your cast iron skillet (standard 10") with coconut oil, if it is not well seasoned. Remove the cookie dough from the refrigerator and press into the bottom of your cast iron skillet pushing it a little up the sides or making a little thicker around the edges as you would with a pizza crust so it's slightly indented in the middle about a 1/2" in from the edge. Bake cookie for 20 minutes, it will look set and golden brown around the edges. Let cookie cool and pan come to about room temperature before placing the pan in the freezer. Turn oven heat down to 325F. Spread coconut on a rimmed backing sheet. Toast coconut for 4 minutes, stir, toast another 4 minutes, and carefully watch from there every couple minutes until you get nice golden brown coconut. Let the coconut toasted cool. Remove ice cream from the freezer to soften. Remove your cookie from the freezer and spread ice cream on top of the crust in a nice even layer in the middle staying about 1/2"from the edge to keep your crust to hold on to. If your ice cream is too soft and is melting place your pan in the freezer for 10-15 minutes as you do not want your toppings to sink. Place berries on top of the ice cream and sprinkle with toasted coconut. Place pan back into the freezer for 2 hours, or until frozen. When ready to enjoy remove your pan from the freezer and using a sharp knife slice your pizza. If your cookie is stuck to the bottom of the pan turn the burner on your stove to high and place the cookie on the stove for 20-30 seconds to heat up the oil in the cookie and it will release. Make your own oat flour grinding oats in a mini food processor until you have a flour like texture. You can omit berries and use other toppings of choice. You are such a whiz with this cashew ice cream! Dairy-Free #FrozenFridays Recipes + BIG So Delicious Giveaway!